[S31] Navarro Leaves and Branches, vol. XXV, no. I (Feb 2002), p. 22. [S31] Navarro Leaves and Branches, vol. XXV, no. I (Feb 2002), p. 22 (naming Phillip Highnote as her father). [S31] Navarro Leaves and Branches, above, vol. XXV, no. I (Feb 2002), p. 22 (naming Nancy Ann Southerland as her mother). [S31] Navarro Leaves and Branches, above, vol. XXV, no. I (Feb 2002), p. 22. [S738] Ellen Nelson, chart of descendants of Susan C. Bowden and Dave Queen sent to Roger Bartlett, 11 April 2002,(naming Dave Queen as his father). [S738] Ellen Nelson, chart of descendants of Susan C. Bowden and Dave Queen, above,(naming Susan C. Bowden as his mother). [S738] Ellen Nelson, chart of descendants of Susan C. Bowden and Dave Queen, above. [S15] Navarro County, Texas Marriages, vol. 2, 1889-1899 (Corsicana, Tex. : The Navarro County Gen. Soc'y, 1987), p. 204 (citing Navarro County, Texas Marriage Records, vol. XI, p. 422). [S1207] Corsicana Daily Sun, Corsicana, Tex., online archive at http://corsicana.newspaperarchive.com, 5 Jun 1924, p. 1, col. 4 (obituary of D. A. Queen). [S1207] Corsicana Daily Sun, Corsicana, Tex., online archive, above, 11 Nov 1957, p. 2, col. 1 (obituary of T. D. Queen). [S1076] 1900 U.S. Census, Navarro County, Tex., City of Corsicana, sheet 21, line 95 (naming David Queen as his father). [S1076] 1900 U.S. Census, Navarro County, Tex., City of Corsicana, sheet 21, line 95. [S1076] 1900 U.S. Census, Navarro County, Tex., City of Corsicana, sheet 21, line 96 (naming David Queen as his father). [S1076] 1900 U.S. Census, Navarro County, Tex., City of Corsicana, sheet 21, line 96. Marriage*: She married Charles Finney. [S1076] 1900 U.S. Census, Navarro County, Tex., City of Corsicana, sheet 21, line 99 (naming David Queen as her father). [S312] Social Security Death Index, online at http://tinyurl.com/AncestrySSDI, viewed on 27 Sep 2002 (giving the date but not the place). [S1076] 1900 U.S. Census, Navarro County, Tex., City of Corsicana, sheet 21, line 99 (stating that she was born in July 1895 in Texas). [S312] Social Security Death Index, online at http://tinyurl.com/AncestrySSDI, viewed on 27 Sep 2002 (stating that she died in Aug 1965; not naming the place of death but stating that she lived in Houston, Tex. when she died). [S312] Social Security Death Index, online at http://tinyurl.com/AncestrySSDI, viewed on 27 Sep 2002. Other Names*: Mary Sue Jones Bradshaw, Mary Sue Bradshaw. [S738] Ellen Nelson, chart of descendants of Susan C. Bowden and Dave Queen sent to Roger Bartlett, 11 April 2002,(naming Will James Jones as her father). [S961] Find A Grave, online at http://www.findagrave.com, memorial for Mary Sue Jones Bradshaw, memorial no. 76893582, viewed on 28 Nov 2012. [S738] Ellen Nelson, chart of descendants of Susan C. Bowden and Dave Queen sent to Roger Bartlett, 11 April 2002,(naming John Bowden as his father). [S738] Ellen Nelson, chart of descendants of Susan C. Bowden and Dave Queen, above,(naming Thomas Bowden as her father). Marriage*: She married Thomas Bowden, son of John Bowden and _____ _____. [S738] Ellen Nelson, chart of descendants of Susan C. Bowden and Dave Queen, above,(naming John Bowden as his father). Marriage*: She married John Bowden. [S740] Nancy Lovett, electronic mail to Roger Bartlett, 4 May 2002 (naming Nelle Olivia Waters as her mother). [S872] Odessa American, Odessa, Tex., online http://www.oaoa.com/obit/deaths101903.htm, 19 Oct 2003, viewed 19 Oct 2003 (obituary of Nelle Lovett) (naming Nelle Lovett as her mother). [S1371] Buddy Waters, post on Facebook, 15 Apr 2017. [S741] Gaelen D. Gipson, electronic mail to Roger Bartlett, 21 Apr 2002, (naming William Reason Powell as her father). [S741] Gaelen D. Gipson, electronic mail to Roger Bartlett, 21 Apr 2002, (naming Louisa Foster as her mother). [S741] Gaelen D. Gipson, electronic mail to Roger Bartlett, 21 Apr 2002. [S724] Descendants of Joseph and Peter Callaway (n.p. : The Callaway Family Association, Inc., 2000), p. 1 (stating that it "is believed by Bramlett researchers that she married, as his second wife, William Bramlett, Sr (b. c1688; d. after Nov 26, 1759, Bedford Co, VA"). [S724] Descendants of Joseph and Peter Callaway, above, p. 1. [S724] Descendants of Joseph and Peter Callaway (n.p. : The Callaway Family Association, Inc., 2000), pp. 1-2 (naming Francis Callaway as her father). [S724] Descendants of Joseph and Peter Callaway, above, pp. 1-2 (naming Frances Gaddah as her mother). [S724] Descendants of Joseph and Peter Callaway, above, p. 2. [S724] Descendants of Joseph and Peter Callaway (n.p. : The Callaway Family Association, Inc., 2000), p. 2. [S14] "Descendants of Joseph Callaway of Virginia," The Callaway Journal, vol. 5 (1980), p. 76 (stating that she may have married Thomas Noell). [S724] Descendants of Joseph and Peter Callaway (n.p. : The Callaway Family Association, Inc., 2000), p. 3 (naming James Callaway as her father). [S724] Descendants of Joseph and Peter Callaway, above, p. 3 (naming Sarah Bramblett as her mother). [S724] Descendants of Joseph and Peter Callaway, above, p. 3 (stating that she was born "c1761/2"). 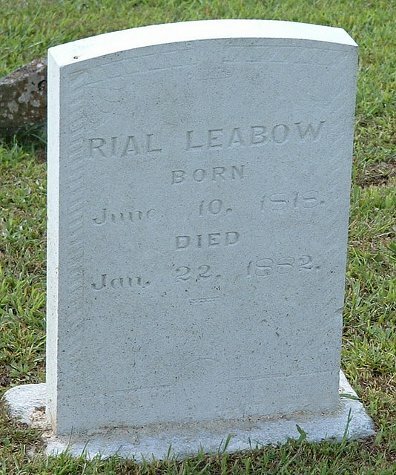 Urial Leabow's tombstone, Leabow Cemetery, Lone Mountain, Tenn., courtesy of Phillip Walker. [S961] Find A Grave, online at http://www.findagrave.com, memorial for Urial Leabow, memorial no. 37093809, viewed on 7 Aug 2011. 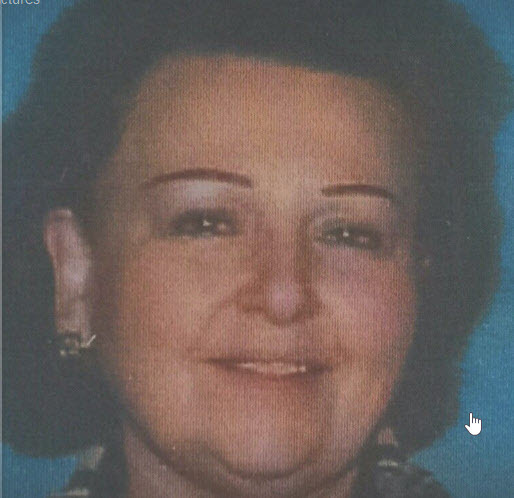 [S961] Find A Grave, online, above, memorial for Rosa A. Sanders, memorial no. 37094006, viewed on 7 Aug 2011. [S961] Find A Grave, online, above, memorial for Louisa Lewis Leabow, memorial no. 37093472, viewed on 7 Aug 2011 (not giving the date). [S961] Find A Grave, online, above, memorial for Sterlin LaFayette Leabow, memorial no. 9776642, viewed on 7 Aug 2011 (naming Urial Leabow as his father). Marriage*: He married Mary ('Polly') Touchstone. [S745] Susan Reichert, electronic mail to Roger Bartlett, 19 May 2002, (naming Richard Buckley as his father). Marriage*: She married Richard Buckley. [S745] Susan Reichert, electronic mail to Roger Bartlett, 19 May 2002, (naming Mary ["Polly"] Touchstone as his mother). [S745] Susan Reichert, electronic mail to Roger Bartlett, 19 May 2002, (naming Noel Webster Buckley as her father). [S745] Susan Reichert, electronic mail to Roger Bartlett, 19 May 2002, (naming Maggie Bush as her mother). [S724] Descendants of Joseph and Peter Callaway (n.p. : The Callaway Family Association, Inc., 2000), p. 4 (identifying her as "Margaret ? Brown, widow"). Marriage*: She married Rev. William Coats. Marriage*: She married Richard Crump. Marriage*: She married Samuel Calland. Marriage*: She married Jesse Abston. Marriage*: She married Caleb Dodson. Marriage*: He married Elizabeth Patrick. [S724] Descendants of Joseph and Peter Callaway (n.p. : The Callaway Family Association, Inc., 2000), p. 8. [S724] Descendants of Joseph and Peter Callaway, above, p. 8 (naming Burwell Brewer as her father). Marriage*: She married Burwell Brewer. [S724] Descendants of Joseph and Peter Callaway (n.p. : The Callaway Family Association, Inc., 2000), p. 8 (naming Elizabeth Patrick as her mother). Marriage*: He married Sallie _____. [S724] Descendants of Joseph and Peter Callaway (n.p. : The Callaway Family Association, Inc., 2000), p. 8 (naming Mrs. Sallie Russell as her mother). [S724] Descendants of Joseph and Peter Callaway, above, p. 8.